In the 1970’s there was a tremendous revival of pulp adventure heroes of the 1930’s and 1940’s. And as a result the paperback racks in bookstores were stuffed with novels reprinting the adventures of such classic characters like Doc Savage, The Shadow, Conan The Barbarian, G-8 And His Battle Aces and The Spider. They were helped along by breathtakingly beautiful covers done by legends of the art world such as James Bama, Jim Steranko and Frank Frazetta. And they sold like crack. And it was like crack to the imagination of a high school student named Derrick Ferguson who spent his entire allowance on buying them and who spent his weekends devouring them voraciously and it was these pulps that shaped my writing ambitions and my style. Publishers who saw this trend for pulp adventure jumped on the bandwagon and soon there was a whole army of modern day characters inspired by the pulps with their own series fighting for space on the racks with their forefathers. Some of them were pretty poor, to be honest. Some like Mack Bolan, The Executioner still survive to this day. One of my favorites was The Inquisitor, a hitman that worked for The Vatican. He had to fast three days for every man he killed while on assignment and his confession was only heard by The Pope himself. But the guy who really stood out and gained a rabid fan following that exists to this day is Remo Williams, The Master Of Sinanju who is the hero of “The Destroyer” series of novels which still enjoys life in paperbacks and was featured in the movie REMO WILLIAMS: THE ADVENTURE BEGINS which in the opinion of your humble reviewer is one of the unsung classics of pulp adventure movies. A New York cop (Fred Ward) is catching a coffee break under The Brooklyn Bridge when he stumbles on what appears to be a random mugging. He takes out the three muggers all by himself and while he’s calling for backup in his patrol car, it’s shoved into the East River and he’s presumed killed. He wakes up in a hospital where he’s told by the sharply dressed Conn MacCleary (J.A. Preston) that he’s been handpicked to be the enforcement arm of a secret organization called CURE. “Why CURE?” The cop asks. Cleary answers; “because this country has a disease and we’re the cure. You’re going to be the Thirteenth Commandment: Thou Shalt Not Get Away With It.” Which I think should be the motto of just about every pulp hero. MacCleary gives him his new name: Remo Williams and takes him to meet the head of the organization, one Harold Smith, who works in a dark sub-basement of The World Bank. Smith tells him that CURE has only four members: MacCleary, Smith, Remo and the man who will train Remo: Chiun (Joel Grey) The current Master Of Sinanju, an ancient Korean who will teach Remo the art of Sinanju, which is the martial art from which all other martial arts such as karate, kung fu and ninjitsu was derived. CURE is an organization that is only known to The President of the United States and answers only to him. Chiun is takes Remo under his wing as his student and informs him that The House of Sinanju has a long history of ‘perfect assassinations’. 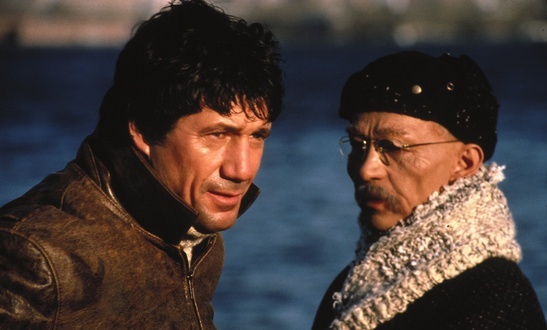 As Chiun tells Remo in a scene that is hysterical to watch and listen to courtesy of Joel Grey’s utter seriousness and Fred Ward’s increasing disbelief, assassination is the highest form of public service. The House of Sinanju is responsible for the deaths of such notable historical figures as Alexander The Great, Napoleon and Robin Hood. All perfect assassinations carried out with such skill and grace that they appeared to be accidents or natural deaths. Chiun begins training Remo for his job while Smith lines up his first job: an industrialist named George Grove (Charles Cioffi) who has been bilking the United States Army out of billions with a weapons systems called The Harp that doesn’t work. Grove’s theft has come to attention of Major Rayner Fleming (Kate Mulgrew) who is making trouble for Grove and she’s targeted to be killed. Smith assigns Remo Williams to protect Major Fleming and expose Grove’s evildoing. REMO WILLIAMS: THE ADVENTURE CONTINUES isn’t a movie that comes up very often when people discuss superhero or pulp inspired movies but it’s a movie that I highly recommend you seek out and watch. Mainly for the performances of the always likeable and watchable Fred Ward (who would have been the perfect Rocky Davis if a ‘Challengers Of The Unknown’ movie had ever been made) and Joel Grey as Chiun. Their relationship in the movie is what really sells this movie as it progresses from one of active hatred to respect and love to the point where Chiun calls Remo his son and Remo calls Chiun ‘Little Father” The training scenes are a lot of fun, especially the one where Chiun seeks to conquer Remo’s fear of heights by having him stand on the top of a moving car of Coney Island’s world famous Wonder Wheel while dodging the other moving cars. The scene is helped tremendously by the fact that it’s obviously Fred Ward doing his stunts and it’s nail-bitingly suspenseful as well as hilarious, once again courtesy of Joel Grey’s comments. In fact, Joel Grey effortlessly steals the movie as Chiun. He creates a wonderfully eccentric character that is as wise and as badass as Master Yoda. But a whole lot funnier. Chiun is capable of taking out an army of fully armed men barehanded but he’s also addicted to soap operas which he considers to be the highest artistic achievement of American culture. One of the best scenes in the movie is when he is forced to tell Remo that if Remo fails in his assignment to take out Grove that Chiun will have to kill Remo. The scene is done with a degree of feeling and sheer acting power that lifts it out of what could have been a run of the mill action movie and approaches real heart. It’s a terrific scene. It’s also helped by the music which is done by Craig Safan and it is absolutely one the best music soundtracks ever done for a movie. The theme music is guaranteed to get your heart pumping. The only let down of the movie is the bad guy. Charles Cioffi’s George Grove really isn’t much of a villain and he’s not much of a threat. The fact that he’s stealing billions of money from the US Government reduces Remo to not much more than a high level collection agent and Grove’s crew of henchmen aren’t on the level of James Bond style enforcers such as Oddjob or Jaws which is what the movie really needs to give Remo a real threat. But the performances are what really sell this movie, especially those of a pre ‘Star Trek: Voyager’ Kate Mulgrew, Fred Ward and Joel Grey. Joel Grey won two awards for his role in this movie: One from The Golden Globes and one from The Academy of Science Fiction, Fantasy and Horror Films and he deserved them both. So should you see REMO WILLIAMS: THE ADVENTURE BEGINS? You get an enthusiastic Hell Yes from me. It’s a lost classic that needs to be seen by lovers of the pulps. It’s modern day pulp all the way and it’s done with style, class and a love of the genre. It should be seen just for the terrific performances of Fred Ward and Joel Grey is nothing else. It’s a great Saturday afternoon movie. Enjoy with my blessings. “You drive like a pregnant orangutan,” Chiun. Best line EVER. By the time I saw the movie, years later on TV, I was already a fan of the book series. It’s well worth checking out. Much better villains and the magnificent Master Chiun (the true star of the series) is around to tell Remo how he has squandered his life trying to make a diamond out of mud. Reprints are on Amazon and coming to B&N also. Plus the surviving author, Warren Murphy, has revived the series. So far there is a novel, two novellas and a spin-off series, and more coming soon. I watched this movie as a kid and hated it, but I’ll give it another look. (Goes to add it to queue.) Or I would, if Netflix had it. Yeah, awesome as Netflix is, it don’t have everything.